Hard to believe that several of rocks most iconic albums are celebrating their silver anniversary this year. While most of the media hoopla has surrounded the 50th birthday of The Beatles' Sgt. 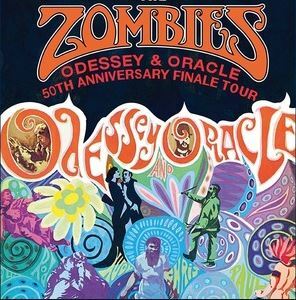 Pepper's Lonely Hearts Club Band (which is coming up on June 1st), their British Invasion counterparts, The Zombies, are touring in celebration of the half of a century since their masterpiece, Odessey and Oracle, was created. While the record was not officially released until April of 1968, it was actually recorded in the months between June and August of 1967 - so an observance this year is more than justified. The Zombies, who performed at the Wilbur Theater in Boston, MA on May 9, 2017 (a make up date from a cancelled show in April), shook up their set list a bit since they last visited the Boston area in late 2015. The touring version of the band (featuring original Zombies, Colin Blunstone and Rod Argent, are still backed by Jim Rodford, Steve Rodford, and Tom Toomey), opened the nights first set. Some outstanding moments included a killer take of Bo Diddleys Road Runner (on which guitarist Toomey really shined) and unearthed the chestnut Just Out of Reach, from the soundtrack to 1965 Otto Preminger film Bunny Lake Is Missing, for which the original quintet had recorded 4 songs for the films score. While not a Zombie tune originally, they once again revived the group Argents (the 70's entity led by Rod Argent after the initial demise of the Zombies) major classic rock staple, Hold Your Head Up, where Argent gleamed with a blistering keyboard solo, while they later capped off the first set with the iconic She's Not There, and The Way I Feel Inside. The group also tossed in a few ditties from their 2015 album, Still Got That Hunger (which actually cracked the Billboard top 100 in 2015 - a fact they were rightfully most proud of). Most impressive of the newer tunes was the bands re-recording of their own I Want You Back Again. The second set featured the entire Odessey and Oracle, in full, and original members Chris White (bass and vocals) and Hugh Grundy (drums) were brought out to complete the surviving original lineup (original guitarist Paul Atkinson passed away in 2004), with Toomey on guitar, while Rodford shared back-up vocal duties with Viv Bouchera (who is also Whites spouse). Opening with the harmonic heaven of Care of Cell 44, the original members flawlessly ran through their most storied creation. The presence of the original members in 2017 is quite extraordinary in several aspects, mostly as they are still vocally so strong: Blunstones voice, while long celebrated is still intact, and White astounded the crowd while taking the lead on Butcher's Tale (Western Front 1914), sounding as lucid as he did 5 decades ago. At the completion of Odessey and Oracle, an encore of She's Not There, was expanded free-form style, sounded more akin to the Santana cover version at times. A vast end to a night of British Invasion era inventiveness.